Third quarter reporting season is wrapping up with the majority of companies missing their forecasts. As the last few companies release earnings next week, only 42% have met or exceeded estimates thus far. The common excuse? Hurricane Katrina of course. Not since "El Nino" has there been a more popular scapegoat. 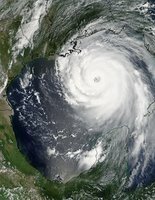 At last count, well over 100 companies have blamed Katrina for affecting their earnings according to Reuters Estimates. Ok, maybe I'll forgive Walmart's miss due to all the store closures... but Intel and Amazon? There was, of course, a direct impact on many insurance, home-building and oil-related companies. But from chipmakers to Internet companies, seemingly unaffected companies are blaming their short-comings on the disaster. Many on Wall Street are showing increasing skepticism and wonder if the "Katrina get out of jail free card" is a coverup for other problems. For instance, cosmetic firms Estée Lauder and Avon both slashed 2005 earnings forecasts in part due to Hurricane Katrina, adding that higher gas prices hurt both its representatives and customers. But both companies were struggling well before Katrina hit. Such excuses make Krispie Kreme's "Low-Carb Craze" excuse look legit. And one of the most extreme? Folgers coffee. Last Sunday, a 77-year-old lady in Iowa found a dead baby turtle in the 2-pound package of Folgers coffee. She said a customer service representative explained that because many Folgers plants are based in New Orleans, the turtle might have ended up in the coffee as a result of Hurricane Katrina. A spokesman for Procter & Gamble (the company that owns the Folgers brand) said it's too early to say how the turtle ended up in the coffee. Although the previous example obviously did not affect earnings (Proctor & Gamble actually exceeded estimates), it shows the broad impact of Hurricane Katrina. Some companies may mistake the hurricane with the real factor that's squeezing the economy: the campaign by the Federal Reserve to raise short-term interest rates. It will be interesting to see if these companies' misfortunes are indeed attributable to weather or perhaps better attributable to the Fed and slowing economic growth.